Tomorrow is going to be a very, very difficult day for many. Our hearts go out to those who’ve lost loved ones, or were injured in the catastrophe. But, we must go on, and we must learn from what happened. We have to get ready for tomorrow. 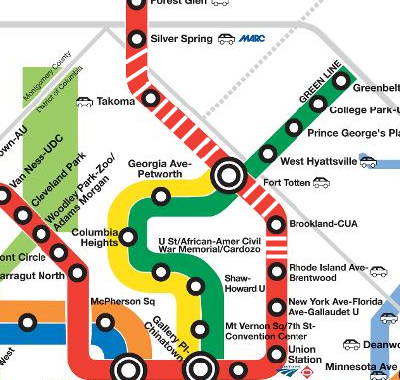 - Red Line Metro Rail service between Rhode Island Ave/Brentwood and Silver Spring. This will be closed all of Tuesday, and possibly longer. It’s going to take some time to get things back to normal on those tracks. - Brunswick Line MARC train service will not be running on Tuesday. There are options for getting around tomorrow, even though there is a giant hole in the Red Line. So, let’s ask one question, if you’re going to be affected by the Red Line closure or MARC train cancellation: Do you really need to be in the office? If you can work from home tomorrow, or take a mental health day, or can afford to call in sick, give it some thought. It’s not that your job isn’t important, but tomorrow’s going to be a royal cluster out there, and if you can stay home and still get everything done? Do it. For everyone. If you can possibly use the Green Line, instead of the Red, or bus to the Green Line and take it in, that would be a good option. Commuters who are coming from the edge of town can continue to park at the outer-edge Metro stations on the red line and deal either with the shuttle bus, or attempt to park at College Park Metro, but parking’s going to be at a real premium, so if you’re not early, you’re going to miss out. Dr. Gridlock has some ideas about alternate busing solutions as well. Whatever you do, be prepared for delays. Metro will be operating on full manual control tomorrow, which means that trains won’t be at top speed, and braking may be a bit of an adventure. Hold on tight. Leave a little earlier, if you need to be there on time. The trains are going to be crowded, the buses are going to be crowded, so, and I can’t believe I’m saying this, but I am, make sure you’re showered tomorrow, and make sure you’ve got deodorant going. Lay off the cologne and perfume, though, as that can be just as bad, if not worse, than BO. Be polite. Squeeze in a little tighter if you have to. Don’t block the doors. If you have to, get off the train and get back on after people have debarked. If you miss a train, it’s not the end of civilization. Relax. It will be okay. And yes, I’m telling people to go ride Metro tomorrow. Metro is, historically, a very safe system. Less than a dozen people in the last 33 years of its operation have come to their end in an accident. You’re far safer on Metro than you are on the Beltway or on the surface streets, where thousands die every year in car wrecks. This entry was posted in: Talkin' Transit, The Features, WMATA, WTF? !